The Power of the Parti Quebecois Compels You! Keith Topolski examines the latest bout of xenophobia to spew forth from Quebec. The most memorable line from the classic film Forrest Gump was about a box of chocolates being compared to life. The second most famous line, to my mind at least, was ‘Stupid is as Stupid does’. The Government of Quebec, headed by the famously anti-anything-that-isn’t-French Pauline Marois, recently demonstrated it’s intellectual bankruptcy by finding a way for a province in one of the strongest Western economies, indeed global economies, to shed 30,000 jobs in a single month. Now, the non-stupid response would have been to try and deregulate, maybe cut taxes, open up the economy to business. Nice try, this is the Quebec Government we’re talking about after all. No, THEIR response was that the problems are all caused by those evil God-believers, Allah-believers and, well, believers in ANY omnipotent being which has power over us. The best way to rescue an economy that makes Greece look stable? “..ban veils, kippas, turbans and other symbols from government offices, hospitals, schools and any other place that receives public funding”! Isn’t it obvious?! Of course, Quebec geared up for this attack on freedom of expression by banning the clearly performance enhancing turban from all soccer matches played within Quebec. Well, maybe not performance enhancing, but we can’t have a show of cultural diversity, so there! Well, actually, Pauline Marois claims that Quebec is a vibrant, tolerant province and, in order to protect that diversity, it must suppress that diversity from the public square. 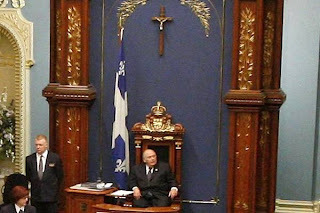 I kid you not, to protect religion, the Premier of Quebec says it must be suppressed. In suppressing religion, some have argued that a discussion needs to be had over the promotion of religion within the public space. This is a legitimate debate, but the Quebec Government decided to skip around that point because, well, the Quebec Government’s house is just a special exemption to this cause, while its employees are not, ok? This brainless act by Parti Quebecois has even been attacked by the teacher’s unions, who have stated that they will support any teacher sacked for wearing a religious icon, on the basis mainly that the Government are a bunch of filthy hypocrites. Freedom gets a run in there somewhere, sure, but hypocrisy is the main beef. Perhaps the union might like to make the point that, should this law be passed, Quebec might also run into a small problem of having a lack of luxury items like doctors and nurses. Whoops, the Government clearly didn’t think of that, so maybe they might allow for a little bit of leniency in some areas of life, like those pesky doctors and nurses who don’t do anything important. However, with all these exceptions, it will be a great way to create an extra 30,000 jobs in the bureaucracy to deal with the ‘administrative chaos’ this would cause. This attack on public employees, not because of their performance, but because of their religion smacks of the most flagrant sectarianism one could possibly come across, and it is quite right that people living in Quebec should challenge the Government on the question of whether the Government views certain citizens as being ‘Quebec’ enough. Of course, identity is a huge issue for Federal NDP leader, and Quebecer, Thomas Mulcair, whose opposition to these new proposals is due to religious discriminationinfringement on freedomslack of tolerance the possibility of targeting Muslim women. Newly elected Liberal leader Justin Trudeau, also from Quebec, also took the chance to condemn the laws. Such condemnation from Non-Quebecers (!?!) led to a demand from Bloc Quebecois leader Daniel Paille (whose party is travelling so well, their own leader doesn’t have a seat in Parliament) to allow Quebecers to have their own discussion on the laws. All those Albertans (commonly referred to as Canada’s answer to America’s deep south) like Trudeau and Mulcair getting in the way must really peeve Quebec. Of course, when a real Albertan, like Muslim Mayor of Calgary Naheed Nenshi, calls the charter what it is, it’s all a conspiracy by the ‘pathetic anglo media’ to portray Quebec as a province that is intolerant of the other. Yeah, like the Anglos from outside Quebec are the only people calling this Government on its bigotry. However, some are Quebecers are simply giving up. English school enrolments are dropping so fast the system is in danger of collapse, Universities and families of returned soldiers are under attack, and we’ve already touched on the 30,000 jobs gone in July alone. What is most galling about this is how, if such an attack on a religious or ethnic minority occurred elsewhere in the Western world, it would be called out for the bigotry it is. And it did and it was. The Government of Quebec likes to declare itself a tolerant nation (yes, Quebec is apparently a nation, although how it squares that away with claiming Canadian equalisation payments is beyond me), full of diversity, but it doesn’t like that diversity being on display. However, perhaps we have misjudged Ms Marois’ intentions, so we’ll let her speak for herself. So, what does Ms Marois want to say, directly, to the minorities and believers of Quebec? (DISCLOSURE: While baptised a Catholic, I now identify as agnostic). Attorney-General Mark Dreyfus today appointed a new Race Discrimination Commissioner – Tim Soutphommasane. Mr Soutphommasane is openly of the political Left: he joined the Labor Party at the age of 15, he worked for Bob Carr when Carr was NSW premier, he did a stint at Labor lobby firm Hawker Britton and has connections with the UK Labour party. But it’s not Mr Soutphommasane’s partisanship that is the real concern. The much more significant matter is his appalling record on freedom of speech. …free speech can never be an ultimate value. It can’t always be the only value that counts. Sometimes the state is entirely justified to suppress speech. Mr Soutphommasane has also said that the kind of free speech restriction found in section 18C of the Racial Discrimination Act is fine as long as there are certain ‘free speech exemptions’. The newly appointed commissioner also believes that too much free speech can “undermine…capacity to participate in society” because speech that hurts people’s feelings can have a “silencing effect.” This is the kind of nonsense we can now expect from the newest employee of the government body charged with protecting our most fundamental human rights. So it’s clear the Australian Human Rights Commission will remain populated with commissioners who have no interest in upholding liberal democratic human rights. This man is a total hypocrite, and Menzies House is proud to have opposed any and all moves to censor the internet since they were first proposed by Labor. Keith Topolski marks a great day for Canadian free speech. We have recently seen the disgraces of the Racial Discrimination Act in prosecuting and, indeed, persecuting leading conservative columnist and blogger Andrew Bolt for no other reason than he offended a few delicate petals by calling for an end to racism. This law is clearly an attempt to shut down debate and needs to be removed. And indeed, there is hope. And yet again, it comes from the brilliant conservative government in Canada led by Stephen Harper. Courtesy of Ezra Levant in the Toronto Sun, read on to see what is happening in Canada, and what should be happening in Australia. For 34 years, Canada has had a disgraceful censorship law that violates our human rights. In 1977, Pierre Trudeau rammed through the Canadian Human Rights Act – an Orwellian name for a law that actually destroys real rights. The entire law is a corruption of justice – it creates a kangaroo court, run by non-judges, that does not follow the same rules and procedures of real courts, but has massive powers to punish and fine people who aren't politically correct. But the worst part is Section 13, the censorship provision. Section 13 creates a word crime – the crime of publishing or broadcasting anything that can cause hurt feelings. Back in 1977, that law was focused on telephone lines and answering machines. But 10 years ago, it was expanded to include the Internet. So it even covers things like whatever you post to your Facebook page. Section 13 says "it is a discriminatory practice … to cause to be … communicated … any matter that is likely to expose a person … to hatred or contempt." So if you publish anything on Facebook, or on your cellphone voice message, that might make one person feel bad about another, you've just broken the law. Truth is not a defence to being charged with "hate" under Section 13. Fair comment is not a defence. Religious belief is not a defence. Telling a joke is not a defence. The law has nothing to do with truth or the right to have an opinion. It's about whether or not you've offended someone or hurt their feelings. Section 13 is an insane law. So un-Canadian, so contrary to our traditions of liberty that go back centuries, inherited from the United Kingdom. It's no surprise that this law had a 100% conviction rate in Canada for the first three decades of its existence. This federal law was copied by provincial legislatures. B.C., Alberta and Saskatchewan all have censorship provisions, too. I found out about this the hard way. In February of 2006, I published a magazine called the Western Standard. We reported on the major news story that month – riots around the Muslim world purportedly in response to some pretty banal Danish newspaper cartoons of Mohammed. Those riots killed more than 200 people, and we wanted to show our readers what all the fuss was about. But a radical Muslim imam in Calgary named Syed Soharwardy complained to the Alberta Human Rights Commission. He said I violated his human right not to be offended. He wanted to ban the cartoons, and his hand-scrawled complaint even bitched about the fact that I dared to publicly defend my right to do so. I laughed off that little nut-bar. I mean, get a life – you're in Canada now, no Saudi Arabia. But to my surprise, the Alberta Human Rights Commission took his complaint and ran with it. The Alberta government, using its provincial version of Section 13, prosecuted me for 900 days, with no fewer than 15 government bureaucrats and lawyers. It spent $500,000 prosecuting me, before dropping the case – and leaving me with my $100,000 legal bill. But sometimes freedom wins a round. Last week, the federal justice minister, Ron Nicholson, stood up in the House of Commons and answered a question about Section 13. The question was about a private member's bill, put by Brian Storseth, an MP from northern Alberta. Storseth has introduced a private member's bill, C-304, to repeal Section 13. But private member's bills have little chance of passing without the endorsement of the government. But Nicholson did endorse it. He called on all MPs to support it, too. Bill C-304, Storseth's bill, is now effectively a government bill. And with a Tory majority in both the House and Senate, this bill is as good as done. No more witch hunts by the Canadian Human Rights Commission. No more persecuting their political and religious enemies. This is the best thing the Harper government has done in five years. Freedom is on the march. "Andy Semple of the Menzies Institute claims it's "refreshing" for someone with Murray's standing to take on the global warming "scam" by expressing such views. Fascist Adolf Hitler tattooed and then murdered over 6 million Jews by marching them into the gas chambers and now the mouthpieces for the eco-fascists climate changers suggest we “deniers” are deserving of a similar fate. Listen to Fabian Society member Anna-Maria Arabia, who is the chief executive officer of the Federation of Australian Science and Technological Societies, who this week launch a campaign against what she claims is the damage done to science by climate change “denialists”. Arabia complained she received an email saying she would be "strung up by the neck" and killed for her promotion of mainstream climate science. "It was very unpleasant, and this one was just to me as opposed to a whole chain like they normally are," Ms Arabia said. "No person, whatever they do, should have to put up with that. It's completely unacceptable." I agree Ms. Arabia but I also happen to think it’s completely unacceptable to suggest people like me who have the temerity to question the religion of climate change should according to you be denied the opportunity to speak at all about the issue of climate change. I think it’s completely unacceptable that Glover thinks I and others should be tattooed as a “denier”. I think it’s completely unacceptable that Singer advocates it would be very refreshing for people like me to be gassed with high concentrations of poisonous Carbon Monoxide. So meet the George Bernard Shaw’s of 2011 – Anna-Maria Arabia, Richard Glover and Jill Singer. This year’s location: Suvretta House, St. Moritz. To see the full participant list visit, the Zero Hedge page. Despite flying to every nation on the plant besides Indonesia and Malaysia, and doling out wads of cash Kevin Rudd couldn’t land a seat at the 2011 Bilderberg Conference. … and in that terrifyingly censorial hotspot, the People's Republic of China.